I'm still alone in this city. When I have a coconut, I can remember the alone life. I was outside this afternoon and I was so thirsty when I came back home, I bought a coconut again. I had drunk all the coconut milk quickly this time, and ate its fresh. In order to not to forget this feeling and the life when I drunk the coconut, I shot for it. 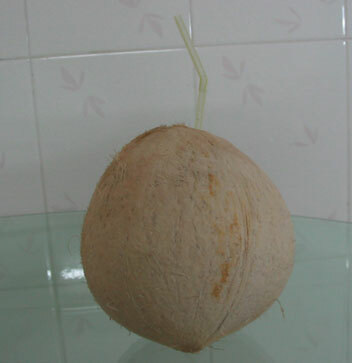 I suggest you to share coconuts with your family and friends, it's the crude drink and not expensive, just 2 yuan in Shenzhen, you can drink the coconut milk through the tube. When you haven't had coconut for a long time and extremely need water and need vitamins, don't forget coconut! Probably you need it. It's just one of my suggestions for you to reference. I like coconut! Click the right mouse button on the blank place, choose "Macro", you can choose the text template that you need.